I am really enjoying making homemade and all natural items here at our house. Having essential oils on hand has really made this easy. 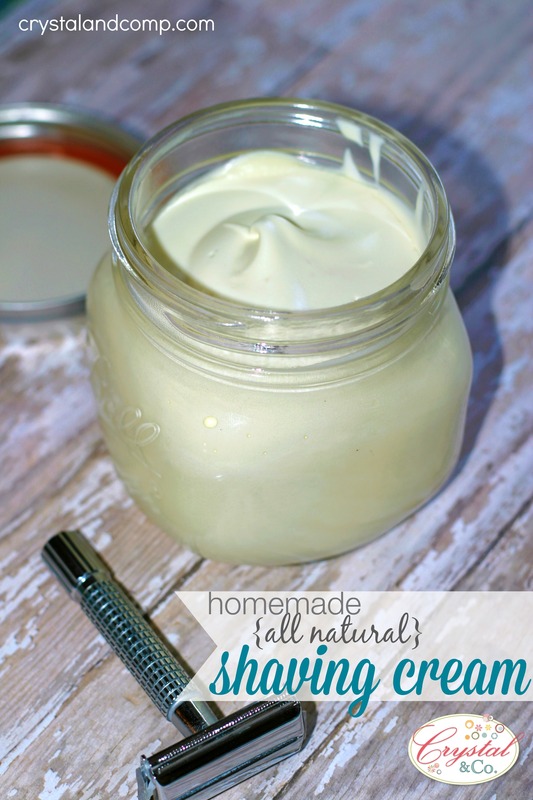 I am in love with this homemade shaving cream recipe. It is chemical free and all natural. This is super easy to make. Let me show you how. Fill a sauce pan with about 1 inch of water. Place your double boiler over it and heat the water in the pan over a medium heat. 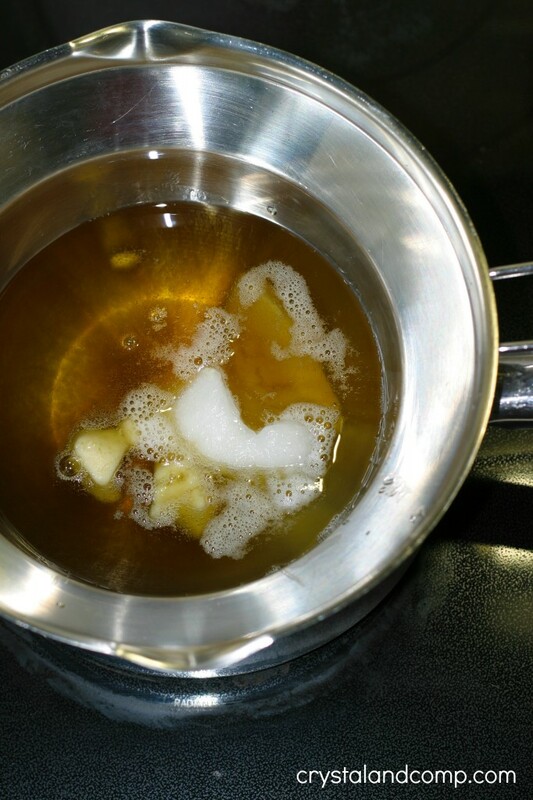 Place the shea butter, coconut oil and olive oil in the double boiler. Let it all melt together. Do not let the oils boil, we are just melting. Once it is melted add 10-20 drops of your favorite essential oil. You can read more about places to buy essential oils online. 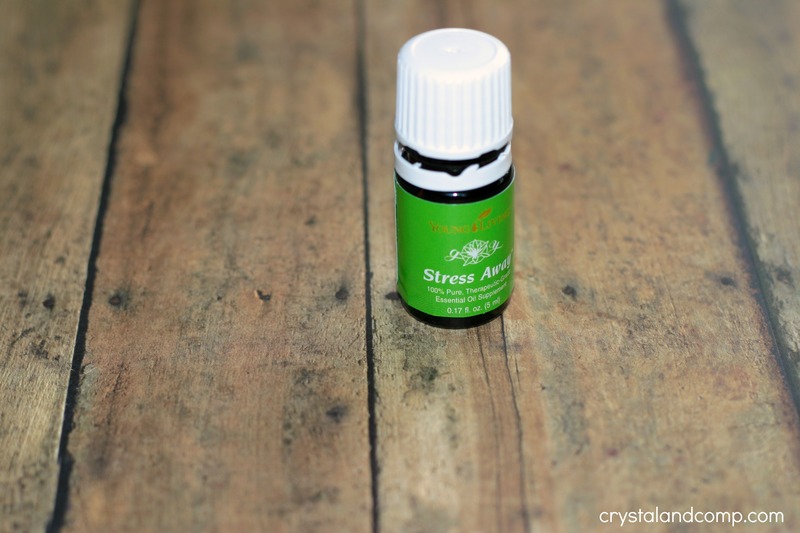 I added Stress Away which smells amazing! Perfect for relaxing and unwinding in the shower. Put the double boiler in the fridge for 2-4 hours to let it begin to solidify again. Once it comes to a firm state, take it out of the fridge and use an electric mixer to whip it for about a minute. The consistency will be like a thin icing you would put on cupcakes. Add the baking soda. Continue to whip for another 30-60 seconds. We want to wait and add the baking soda in this phase because we do not want it to be liquefied with the oils, we want it to be an exfoliate. Now, scoop the cream into containers. I used wide mouth mason jars. Pop the lids on them and place them back in the fridge over night. 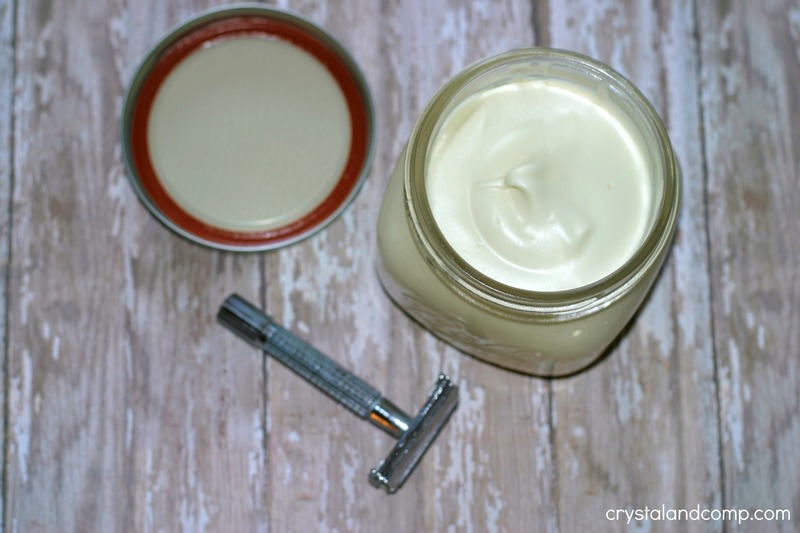 This is so moisturizing you will not need lotion on your legs after shaving. I would not store it in a steamy bathroom as it will start to melt because coconut oil liquefies at 76 degrees. If this happens, pop it back in the fridge. It is actually soothing when it is cold. Obviously, you’ll take it in the shower with you, but I would store it in another room in between showers. Have you ever made homemade soaps, cleaning supplies or solutions? Which is your favorite? My husband would love this! Thanks for sharing. 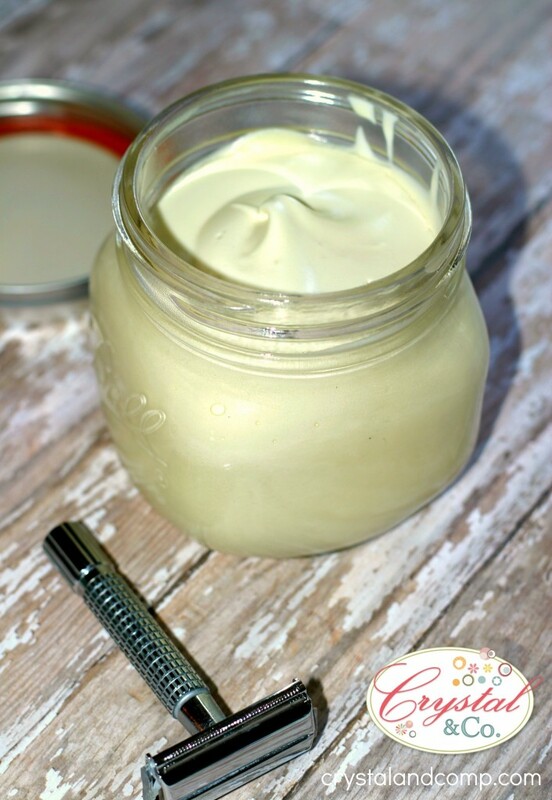 I am loving these homemade recipes for household products. My husband used and said it was like ripping hairs out of his face. He said his skin feels awesome but shaving was awful! What could I have done wrong?? I did notice I put the baking soda in too early but would that be the reason? I thought maybe it just wouldn’t exfoliate like its supposed to. I bet it is not putting the baking soda in at the right time. I’ve made many batches and I’ve had zero issues. My husband and 14 year old have shaved with it and love it. I use it on my legs and underarms and love it. We’ve had zero issues. Or, could it be his razor? Just curious. Great tutorial Crystal … am really trying to cut out all those products in the bathroom with ingredients I just don’t “understand” and shaving cream was on my hit list. Could this be used for shaving cream play? I am just wondering how much cheaper it would be to make this verses buying the can kind? Probably not. The coconut oil melts as it gets warm. Kids will warm it with their hands as they play. 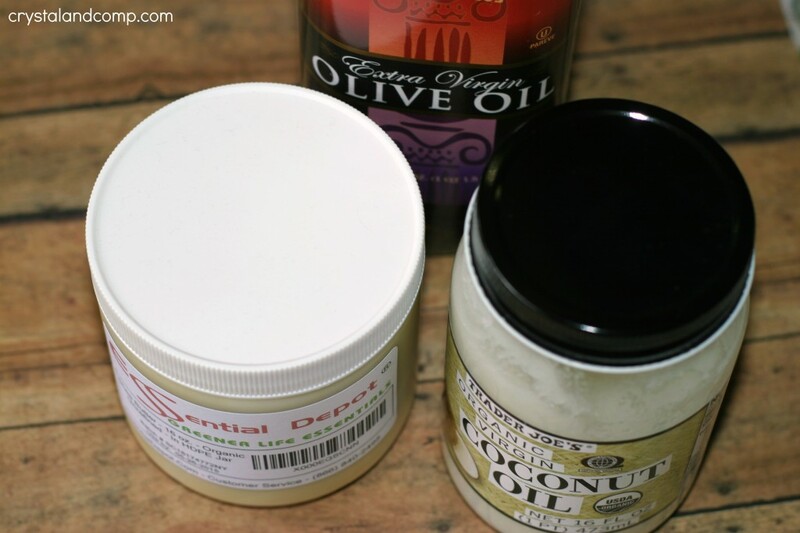 From your experience, is there a replacement for the Shea butter? We are a nut free home but I’d love to try your recipe. Thank you! Could you try cocoa butter? Can I make this without the baking soda? Yes. The baking soda helps with exfoliation.